IPAM seeks program proposals from the mathematical, statistical, and scientific communities for long programs, workshops, and summer schools. Most program proposals are reviewed at IPAM’s Science Advisory Board meeting, held in November each year. If you would like to discuss your program ideas and prepare a proposal for IPAM's consideration, you are encouraged to contact the IPAM Director. For all proposals, please include women and members of underrepresented minorities as organizers, speakers, and participants. Long Programs generally have two complementary streams: one mathematical and one (or more) from other scientific disciplines where there is the potential for a fruitful and exciting interaction. For some programs, the two streams might be two disparate branches of mathematics. A long program opens with tutorials representing the two streams of the program during the first week of the program. This is followed by four workshops, each lasting one week, plus a culminating workshop at Lake Arrowhead. The workshops provide an opportunity to bring in a group of experts on several of the most exciting topics in the area of the program. 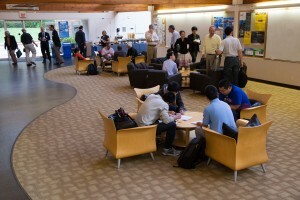 The core participants of the program represent each stream of the program, and include researchers at all career stages. A dozen or more senior scientists from academia or government are essential to provide leadership and mentoring. They are matched by similar numbers of mid-career and early-career researchers, including graduate students. Please include the names of some of the people you would like to invite from both streams. At the proposal stage, you do not need commitments from potential participants. The proposal should also include a discussion of how the program will meet the Institute’s goals of promoting diversity and inclusivity. The Long Program Proposal Template will help you prepare your proposal. You may also wish to discuss your ideas with the Director or one of the Associate Directors. Long Programs are typically presented to the Science Advisory Board for approval two years in advance.